A very impressive former rocket scientist has been working for years to invent a new and fully functioning 3D camera with 360 degree capability. His company is L2VR. It looks like something from outer space - and it works - yet no one really knows how to use it. But its creators, former NASA rocket scientist Lance Lones and his business partner Richard Nimmo, believe the unpredictability is what will sell it. 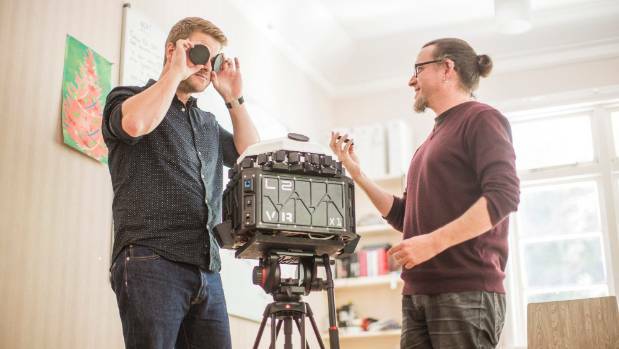 They are talking about a new virtual reality (VR) camera for filmmakers. They say it will revolutionise the way filmmakers create movies, and the way movie-goers watch them. Richard Nimmo, left, and Lance Lones muck around with a prototype of their creation. "It's really quite weird, because nobody quite knows [how it will work] - that's why we think it's really exciting," Lones said. "There's this whole brand-new world of storytelling where nobody quite knows how to tell a story, or what's the best way or what sort of stories are really good for VR. 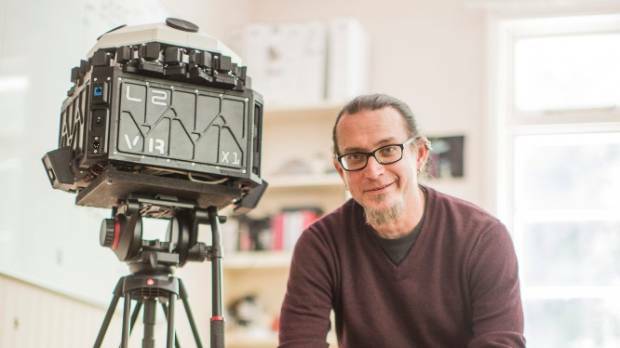 Former NASA rocket scientist turned film camera maker Lance Lones says the prototype of the new virtual reality film camera took him and Nimmo a few years to make. "So, I imagine, if you did Transformers in VR you'd have a lot of people throwing up in the aisles, so you maybe can't do that style of filmmaking," he said. "But there's certainly a world out for there for doing documentaries." The camera - dubbed X15 - is made of lots of smaller cameras that capture 360-degree 3D video. When you put on the VR headset, it feels like you are standing in the exact spot the image was shot. Current VR systems were "very, very rough", Lones said. "It's difficult to get footage off of, you have to stitch it in the end, there's all sorts of post production you have to do. For every hour on set, there's like 20 hours in post [production]. "What were are aiming to do is make that easier - you take the camera and you go 'poom', you press the button, and off you go." Nimmo added: "Though, just as a disclosure, this camera can't take you into outer space. Just so people know." Nimmo said they created something "that no one really knows where its going to go". "But only when large volumes of people start using it, we start to see what is then created and that then develops. "There is definitely demand for it, but you can't guess where its going to go. It's very unpredictable. But we know there are people out there who want to give it a go and buy a camera," he said. "You don't have to do the whole job, you only have to provide the tool and then you leave it up to other people to take it from there." Lones said they had been speaking with a number of filmmakers about the camera - though he remained tight-lighted on the details. "We've talked with folks over the hill a little bit, but we can't say much about that." Lones has worked with Peter Jackson and James Cameron on films including Lord of the Rings, King Kong, Eragon, The Water Horse, and Avatar. The next step for Lones and Nimmo's was to create a production prototype, which contract manufacturers could use to start producing, Lones said. "It doesn't have to go to space so that makes it a little bit easier - it can be fixed on the ground." The invention had been a few years in the making and they were now in the process of trying to secure funding to help them produce the first thousand - which will cost about $5 million, Lones said. "It's been more expensive than I thought, but also less expensive all at the same time. "I didn't expect to be here with what we've spent, I expected it would be a lot more expensive." They were grateful to Grow Wellington and Wellington Regional Economic Development Agency (Wreda) who put them in touch with local contacts who helped to speed up the process, so they could get the product to the people faster, he said. "It's one of those really weird sort of things where you don't think you are making progress until you look back and go, 'We've made a lot of progress with very little resources' and then there's all the people around us who are interested in the product as well and that's sort of exciting to." "We think we've done really well."